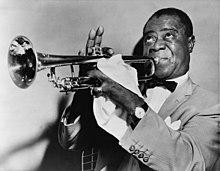 Trumpeter, bandleader and singer Louis Armstrong: as soloist. In music, a solo (from the Italian: solo, meaning alone, even though assolo is now used in Italy when referring to the musical solo) is a piece or a section of a piece played or sung by a single performer. In practice this means a number of different things, depending on the type of music and the context. The word is also used for the act of performing a solo, and sometimes for the performer (more often a soloist). The plural is soli or the anglicised form solos. In some context these are interchangeable, but 'soli' tends to be restricted to classical music, and tends to refer to either the solo performers or the solo passages in a single piece: it would not often be used to refer to several pieces that happen to be for single performers. In many jazz performances, each number will alternate ensemble sections with solo sections where one performer is playing either completely alone, or with unobtrusive accompaniment from the others. Common examples are the rhythm section of jazz bands, and quiet background music by other wind instruments. Such solos are most often improvised. In popular music a solo refers to a "crowd-pleasing" improvised melody played by a single or featured performer and may also refer to a drum solo. Use of the term "solo" appears to follow from jazz and, though they are often pre-composed or originally improvised, the expectation that solos be improvised continues, especially in certain genres. ^ Miller, Michael (2004). The Complete Idiot's Guide to Solos & Improv. ISBN 1592572103. This article is licensed under the GNU Free Documentation License. It uses material from the Wikipedia article "Solo". Allthough most Wikipedia articles provide accurate information accuracy can not be guaranteed.